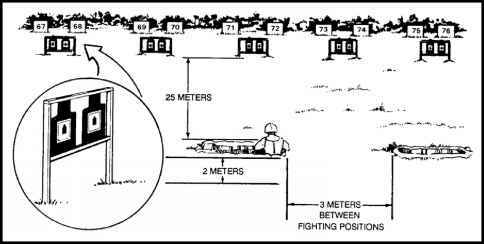 The soldier must understand the rifle components and the mechanical sequence of events during the firing cycle. 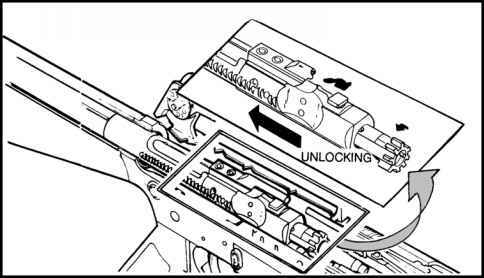 The eight cycles of functioning (feeding, chambering, locking, firing, unlocking, extracting, ejecting, and cocking) begin after the loaded magazine has been inserted in the weapon. a. Feeding (Figure 4-3, page 4-4). As the bolt carrier group moves rearward, it engages the buffer assembly and compresses the action spring into the lower receiver extension. 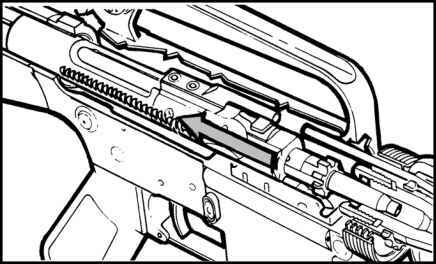 When the bolt carrier group clears the top of the magazine, the expansion of the magazine spring forces the follower and a new round up into the path of the forward movement of the bolt. The expansion of the action spring sends the buffer assembly and bolt carrier group forward with enough force to strip a new round from the magazine. b. Chambering (Figure 4-4). 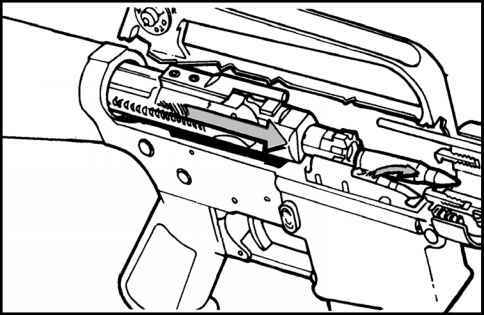 As the bolt carrier group continues to move forward, the face of the bolt thrusts the new round into the chamber. At the same time, the extractor claw grips the rim of the cartridge, and the ejector is compressed. c. Locking (Figure 4-5). As the bolt carrier group moves forward, the bolt is kept in its most forward position by the bolt cam pin riding in the guide channel in the upper receiver. Just before the bolt locking lugs make contact with the barrel extension, the bolt cam pin emerges from the guide channel. The pressure exerted by the contact of the bolt locking lugs and barrel extension causes the bolt cam pin to move along the cam track (located in the bolt carrier) in a counterclockwise direction, rotating the bolt locking lugs in line behind the barrel extension locking lugs. The rifle is ready to fire. d. Firing (Figure 4-6, page 4-6). With a round in the chamber, the hammer cocked, and the selector on SEMI, the firer squeezes the trigger. The trigger rotates on the trigger pin, depressing the nose of the trigger, and disengaging the notch on the bottom of the hammer. The hammer spring drives the hammer forward. 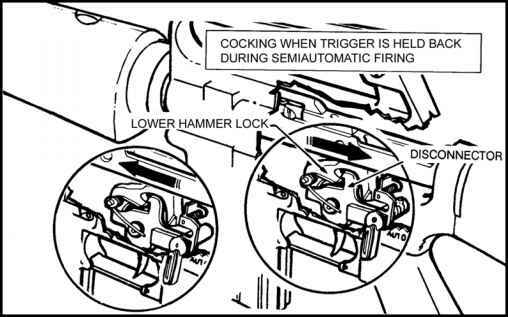 The hammer strikes the head of the firing pin, driving the firing pin through the bolt into the primer of the round. When the primer is struck by the firing pin, it ignites and causes the powder in the cartridge to ignite. The gas generated by the rapid burning of the powder forces the projectile from the cartridge and propels it through the barrel. 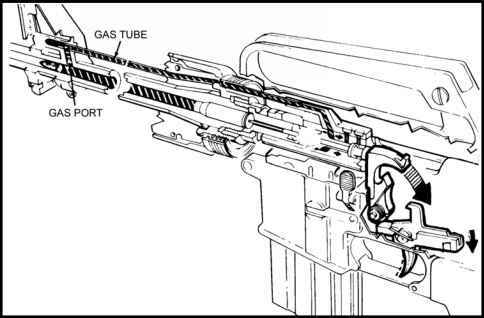 After the projectile has passed the gas port (located on the upper surface of the barrel under the front sight, Figure 4-5) and before it leaves the barrel, some gas enters the gas port and moves into the gas tube. 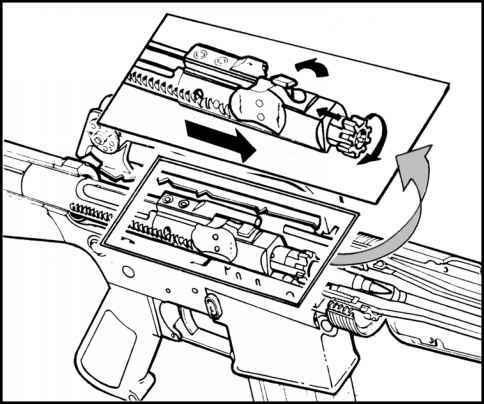 The gas tube directs the gas into the bolt carrier. It passes through the key downward into a space between the rear of the carrier's bolt cavity and the rear of the bolt itself. The gas then expands. The bolt is locked into the barrel extension and unable to move forward, and the carrier is thus forced to the rear by the expanding gas. e. Unlocking (Figure 4-7). As the bolt carrier moves to the rear, the bolt cam pin follows the path of the cam track (located in the bolt carrier). 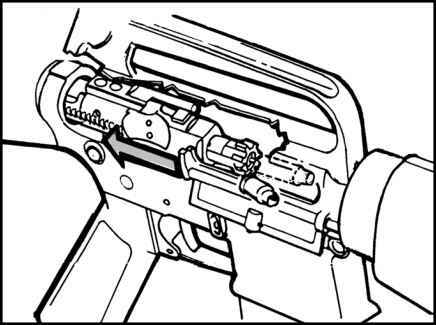 This action causes the cam pin and bolt assembly to rotate simultaneously until the locking lugs of the bolt are no longer in line behind the locking lugs of the barrel extension. f. Extracting (Figure 4-8). The bolt carrier group continues to move to the rear. The extractor (which is attached to the bolt) grips the rim of the cartridge case, holds it firmly against the face of the bolt, and withdraws the cartridge case from the chamber. g. Ejecting (Figure 4-9). With the base of a cartridge case firmly against the face of the bolt, the ejector and ejector spring are compressed into the bolt body. 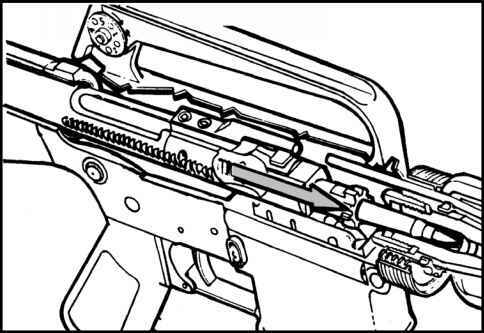 As the rearward movement of the bolt carrier group allows the nose of the cartridge case to clear the front of the ejection port, the cartridge is pushed out by the action of the ejector and spring. h. Cocking (Figure 4-10). The rearward movement of the bolt carrier overrides the hammer, forcing it down into the receiver and compressing the hammer spring, cocking the hammer in the firing position. The action of the rifle is much faster than human reaction; therefore, the firer cannot release the trigger fast enough to prevent multiple firing. How locking lugs lock into the chamber?